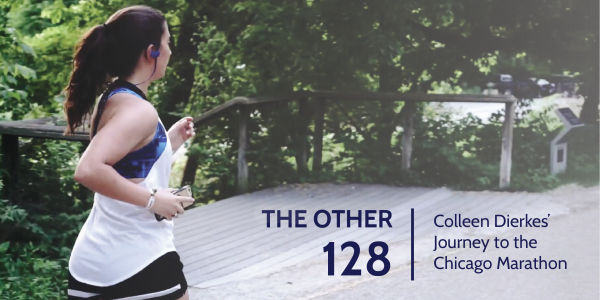 The Other 128 Series is an initiative inspired by the passions and causes our fellows commit to in the 128 hours outside the traditional work-week! Orr Fellowship is full of entrepreneurs, philanthropists, athletes, coaches, learners, innovators, and more. This series highlights their endeavors and showcases the impact Orr Fellows are making in the Indy community. What influenced you to get involved with the Indianapolis Back on My Feet chapter? I was initially captivated by the mission when another Orr Fellow, Lauren Jamison, introduced the organization to me last year. The concept that running could help end homelessness and poverty in the US was so intriguing that I had to learn more about it and how to be a part of it. Due to my crazy schedule between starting both work and Orr Fellowship, I put off joining the group until Lauren, once again, informed me that the Chicago Marathon was accepting entrants. I had been wanting to run a marathon, so why not the Chicago one? It was when I was doing some Chicago Marathon research that I noticed I could fundraise for the amazing nonprofit Back on my Feet as a way to secure my entry to the marathon and help an organization that I had been meaning to join for a while! After I entered I finally started running with BomF at least once a week since, and I love everything about it! What role does your athletic background have in this initiative? My athletic background has everything to do with my role in this organization and initiative. Honestly, I used to hate running. As a soccer player, I usually correlated running with a form of punishment for not playing well. But after graduating from college and thus ending my soccer career, running became the only activity in my life that I felt I could remain relatively competitive in. So when I was introduced to BomF I was immediately obsessed with the idea of combining my love for athletics with my desire to help to Indy community! It might be hard to see the correlation of how running can help those affected by homelessness but my athletic background saw the connection immediately. Running, exercise, and athletics helps instill a sense of purpose, achievement, responsibility, and community back into the lives of people and members in Back on my Feet. Running gives BomF members the motivation to… as cliché as it is… get back on their feet. Have you always enjoyed being involved with local nonprofits? Yes, I have always enjoyed helping my community and involving myself in nonprofits. I really liked the concept of having an impact and making a difference in the ways that I can, even if they aren’t noticed by many people. I love how even the smallest of actions and gestures could have a positive influence on someone or an entire community. I once spent a week reorganizing and carrying boxes around a charity thrift store, nothing special but most of the organization’s workers and volunteers were older and couldn’t do much physical labor. After I finished, I was thanked so graciously for doing something incredibly simple because I made their lives just a little bit easier. I think people forget about that a lot, that just small acts of kindness, like chatting with someone about their life on a morning run, can have the most significant impact on that person. Where did this idea come from to start a video blog series about your journey to training for the Chicago Marathon and ultimately qualify for Boston? Well… let’s just say I have a strong love for Youtube and the community within it. Ever since I was little, I used to watch content from the site, from makeup videos to travel vlogs to comedic skits. AND since I was younger, I always wanted to be a part of the community but never really had a good enough reason to join it. Flash forward to last month, I was figuring out how I to proceed with raising the money I needed for Back on My Feet. After some research, I saw one idea about how to raise money was to do regular posts about your trainings. That was the moment it clicked for me, I finally had a purpose! I finally had a reason to join the YouTube community, a topic with which I could create content, AND a way to raise money for BomF while doing so. Because I want to make my content as valuable and interesting as possible, I decided to train in a way that shows people that if you have the drive, you can to amazing things like qualify for the challenging Boston Marathon. I wish I had come up with the idea earlier so I could have better prepared but I am happy to finally be pursuing this dream that I’ve had for so long. What’s been the most challenging experience you’ve gone through in your training? I am only two weeks in so far, but for training, I always dread my weekly pace runs. Those are runs that I have to keep my 8-minute marathon pace for the entire run which lasts between 5-10 miles. But the most challenging part of this entire experience has been putting myself out there. This is a solo project, and to talk about myself, record myself and then post my video for all my peers to see has really been an emotional experience. I didn’t realize how difficult it would be to post each video to YouTube. I am always thinking, “They’ll hate it” or “my content isn’t good” or worse, “No one will care…” In the end, I have come to the conclusion that I am doing this for BoMF and myself. Even if only one person watches my videos or donates, I’ll be happy because I’ve impacted that one person. What do you need to do to qualify for the Boston Marathon? In order to run in the Boston Marathon, I have to qualify for it by running in another race (i.e. Chicago). That means not only do I have to finish 26.2 miles in 6 hours… I have to finish it in 3:35:00 (men have to finish in 3:05:00). That means I have to run a minimum of an 8:12 mile for 26.2 miles (men have to run it at around a 7-minute mile). Which is insane! Running is a mental game, if I wanted to run 50 miles tomorrow… physically I can probably do that (it would be hard but our bodies can do incredible things) but mentally I would psych myself out after the first 10 miles because I would doubt my abilities. These trainings and this whole project are ways to overcome that mental game. It is a way to prove to myself that I can do ANYTHING I set my mind to as long as I have the passion and commitment to do so because it’s already hard enough to finish a marathon, let alone do it at that fast of a pace. Only 1% of the world has ever run a marathon and of that 1%… Only 5% have run a single Boston Marathon. I am not just hoping but I am training so that I can be within that tiny percentage of the world population that has done it (and help the community while doing so). What impact are you hoping this video series will have on others? This has become a way to not only motivate myself to train and raise money but also as a way to motivate others to push and improve themselves in any aspect of their life (especially running). I hope I inspire people to take on challenges in a way that they feel like they are absolutely capable of accomplishing the goals they’ve set. If I can get one person to start exercising, donate to my campaign, volunteer with Back on My Feet, or run a marathon then this series has been successful because I helped someone in my community grow personally and achieve a goal. What got you interested in videography? I am not sure, I was always obsessed to YouTube and movies throughout my life. I took an internship in which I learned and worked a lot with the adobe creative suite, such as photoshop and adobe premier and I absolutely LOVED it. It was a job where hours would fly by and I wouldn’t even realize it. Combining my love of filming and knowledge of video editing software naturally led me towards videography. This is my first major video project so I still have A LOT to learn. What impact do you think projects like this will have on Orr Fellowship? I hope that Fellows will look at this unique project and reflect on their own crazy dreams and aspirations. This project of mine… it isn’t something that a lot of people dream about doing. It’s kind of different and not everyone supports or understands it. But I have finally decided to pursue a dream and passion that I never thought I could do. I hope that other Fellows will also divert from a traditional path to pursue something they’ve always been passionate about but haven’t yet tried. What help have you received from others and what type of support are you still looking for? Even though this is a personal project of mine, I have received so much support from the community around me. The best help that I am receiving is the advice and wisdom from experienced runners throughout the Indy and Chicago community. They are the source of all the knowledge that I am sharing with my viewers and followers. I also am collaborating with Blue Mile Running Store in Broad Ripple, who supports Back on My Feet. They have been incredible in helping me create great content and motivate me to become a better runner. The thing is, in order for this project to be successful I need people to see it! It is so important to get the word out, and that can be done by sharing my message and my journey. Just a simple like, comment, or share on my videos can go a long way in helping with the success of my fundraising. In the end, the whole point of this is to help end homelessness in our communities so any donations are appreciated, by not just myself but every person involved with Back on My Feet! If you want to help with my project, whether that means helping with filming, editing, sharing running tips, connecting me with awesome runners/businesses/sponsors, or even just running with me in the morning, please you email me at colleen.dierkes@orrfellowship.com. I am always looking for helping hands to help make this project successful! If you want to start running weekly with Back on My Feet check out their page here: https://www.backonmyfeet.org/.